Every shark species is unique, every species has it’s own character and features. Bull sharks deserve the given name. Diving in Playa del Carmen takes place on the depth of 25 meters on sandy bottom. It’s forbidden to bring bright and colorful equipment, so my yellow fins were changed to blue ones. 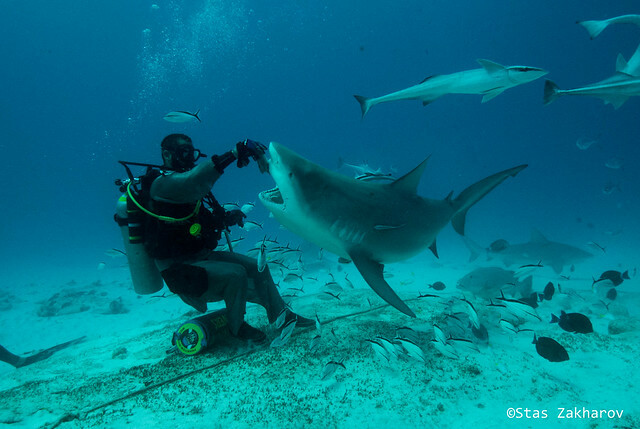 This is the only one kind of diving I know, where divers lay down on the bottom not to provoke sharks – this is basic safety procedure. 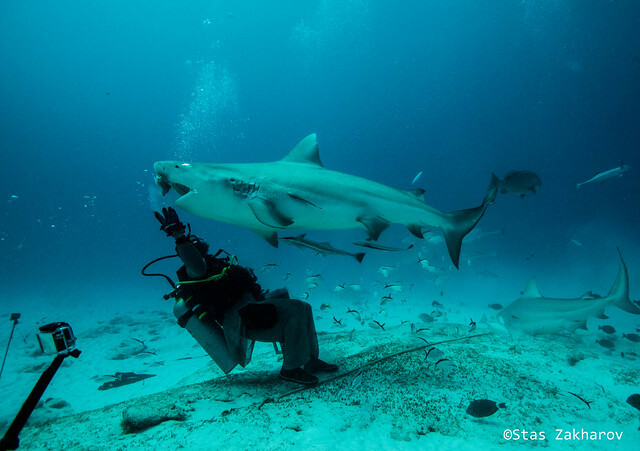 Altough, those sharks are smaller than tiger sharks and great hammerhead – they grow up to 2,5 meters in average, they are very impressive.Not a single species I meet before behave in such an agressive and unpredictable way. This massive blunt-nose fish circles around feeder, their movements are fast and chaotic, they grab everything they pass. Our safety diver was bitten into his hand, fortunately he was wearing shark armour so everything was fine. 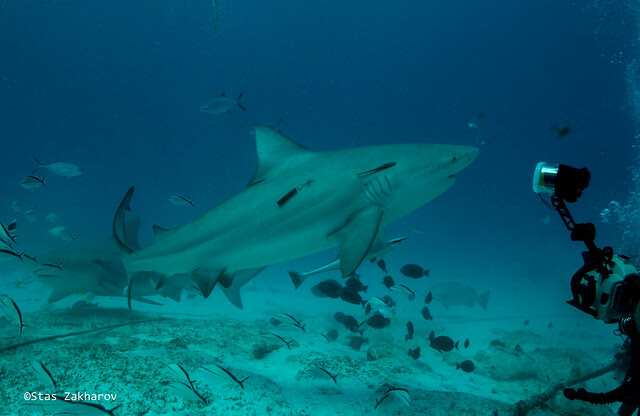 Bull sharks are overwhelming, filled with primal agression, and you feel that you lose control of the situation, feel yourself completely unprotected. 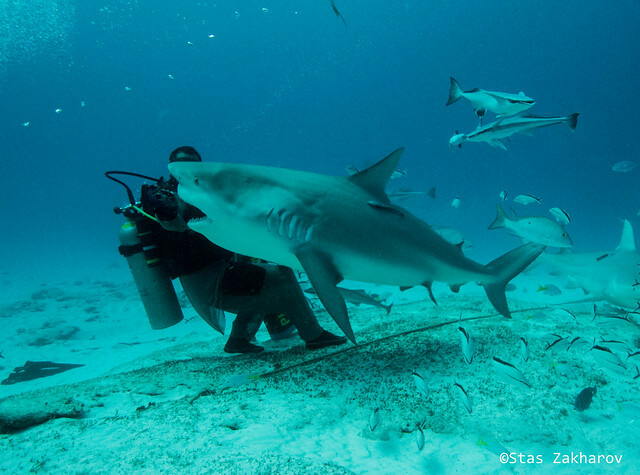 Shark swim so close to you that sometimes you feel it touches your fins or tank. This adrenaline rush is unforgettable and unbeatable. Shark feeder in shark armour looks like primal shaman, slowly moving in a strange dance on the sea bottom, whispering spirits swimming around him. Here are the pictures. I will upload video a bit later. Local diving center is among the best I’ve seen. Everything is done so good, the crew are very cool guys, the real rock-and-rollers of shark diving – very skilled, very professinal and loving their job. And they never had one single accident with the sharks. Why do hammerheads need such a strange head shape?